Vega Menopause Formula is a natural combination of antioxidants, vitamins, minerals, essential fatty acids and isoflavones, which is designed for women who require additional nutritional support during this period of their lives. If you are pregnant or have any medical complaint, consult your doctor before use. 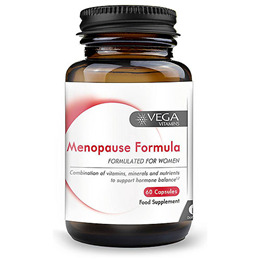 Below are reviews of Vega Vitamins Menopause Formula - 60 Capsules by bodykind customers. If you have tried this product we'd love to hear what you think so please leave a review. I have been taken these for about one month and I feel that they are working well for me. I have tried several different types of menopause tablets and some of them have made my symptoms worse or not worked for me at all. I feel very happy with this product and I am feeling more like myself these days with less hot flashes and mood swings. This product is the best one that I have come across and I will continue to use it as it seems to be working for me.